When I met my husband years ago, his typical breakfast used to be a chocolate bar and a coke. He's got a sweet tooth, no doubt, but since I started enjoying cooking and baking healthy foods myself, I could get him to enjoy healthier and naturally sweet and homemade alternatives for breakfast. 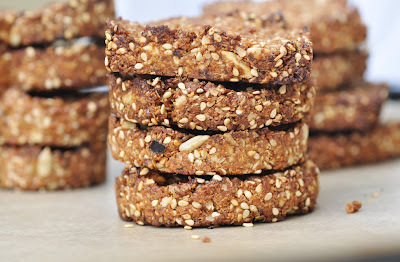 These granola bars are full of whole grains and seeds, sweetened with dried fruit and a little honey. I played around with the dried fruit for some time and got stuck with dates and prunes. I find that dates provide the sweetness and prunes give a little tang to it. They will be a perfect and substantial start for the day that keeps you going until lunch. It's a good breakfast on the go if you are in a hurry, or otherwise is a nice snack between the meals. Mix all dry ingredients (incl. cocoa powder if you prefer a chocolate-y flavor) together in a bowl. Set aside. Combine dates, prunes, olive oil, vanilla extract in a food processor and blend until it becomes a smooth paste. Combine the date oil mixture with the dry ingredients. It will be quite a stiff dough. Make sure everything is well blended. Press the dough onto a baking sheet, it should be about 1 cm high. Alternatively, Place a cookie cutter onto the baking sheet. Press 1-2 tablespoons of the batter into the cutter. The dough should also be about 1cm (1/2 inch high). Gently remove the cutter to preserve the shape. Bake for 15 minutes or until golden brown. If you baked the dough in one big piece, cut them into small bars after they have cooled down. Keep the bars in an airtight container in a dry place.